Will Keenan Robison blow up at linebacker in 2009? Football has become a 24/7, 365 days a year sport. We talk about football in the fall. We watch the spring games in April. And we even follow recruiting with the fervor of a Saturday night in Baton Rouge. But the one aspect of college football that is overlooked is the work done in the summer with 7-on-7 workouts. Vince Young and the 2005 Championship team proved that chemistry and timing built in the summer can propel a team to the top. After a near perfect season in 2008 Colt McCoy and the Texas football team are looking to duplicate the blue print of the last team to make it to the Rose Bowl and win. The similarities of this year’s team to the 2005 squad are alarming and are sure to be talked about like McCoy and Jordan Shipley’s fishing plans. Not all aspects of the game can be worked on over the summer without pads, but plenty can be accomplished. Even with more answers than questions lingering to enter this season there is room for improvement. And here are five questions that could be answered over the summer? 1. What will be the base offensive formation? The lack of a viable tight end may force Greg Davis’ hand when it comes to “go to” formations. In the biggest games of the year, and when Texas needed to move the ball, they abandoned the tight end set for a four wide receiver spread. With McCoy’s accuracy and the depth at the receiver position having a tight end on the field may be a detriment to the team. From a skill stand point there is no question the fourth receiver will be more talented than any healthy tight end on the roster, unless we assume DJ Grant can emerge as a catcher and a blocker in his first year at the position. Frankly, it would be unfair to ask that of Grant so the question becomes – is it more important to disguise your play calls by being multiple on offense with a tight end or is the talent difference so great that putting a tight end on the field is holding the team back? I don’t know the answer, maybe Davis and McCoy don’t either, but a huge summer by the receivers combined with no progress from the tight ends might equal a wide open spread attack for the majority of the snaps. 2. Can Garrett Gilbert handle being the backup quarterback right away? Anyone who has seen or followed the career of the incoming freshman from Lake Travis knows that all signs point to a successful career at Texas and beyond. But all the skill, and smarts, in the world don’t necessarily spell success as a true freshman. In a perfect world Gilbert will only see the field in controlled situations. The plan is to bring him along slowly at the end of games that Texas has in the bag. The problem is Texas cannot be comfortable with Sherrod Harris as the primary backup. The coaches and the players love Harris but he has never shown he could carry the team if needed. And with the junior recovering from surgery Gilbert has the chance to secure the backup spot if he can prove he has what it takes on the field, in his head, and in the huddle. Like it or not Texas is one freak play away from starting a quarterback with no experience. With Chiles at receiver the only real hope is Gilbert. There is no doubt the pressure and expectations will not be fair or realistic for the prodigy, but he should have never expected them to be. This is Texas; he’ll learn that soon enough. 3. Who will be the running back? Realistically this could be a question that isn’t answered at all this season. Mack Brown and Major Applewhite have proven they’ll mix backs in and out as much as they deem necessary. And while they’ll do it again this year, one has to think the staff wants a “go to” guy. A lot of the inconsistencies last year can be attributed to the lack of familiarity with the backs and the offensive line. The running game can be about timing as much as anything and UT had none last year. It is true that the full running game cannot be featured without pads, but Applewhite has shown he values pass protection and ball security over big play ability. Vondrell McGee, maybe the most complete runner in the backfield, learned this lesson the hard way when he was benched for the entire Fiesta Bowl. McGee may be the best runner, but it is Foswhitt Whittaker that can excel in 7-on-7 drills because of his ability to catch the ball and run in space. If he can stay healthy and prove he is willing to block Whittaker may finally break out this season. The other option is freshman Chris Whaley. All reports have the physical freak as being impressive. The coaching staff has all but said he’ll get his shot to compete, so if he can pick up the small things this summer he’ll have a huge chance this fall. 4. Who will start as the third linebacker? Roddrick Muckelroy and Jared Norton have starting jobs locked up in the 4-3 alignment, but with Sergio moving to defensive end one of the outside linebacker spots are open. The two candidates for the position are Keenan Robinson Emmanuel Acho. Both can rush the passer and both can make plays. The skill that may separate them, and determine who plays more, will likely who can play in pass coverage the best. This is where 7-on-7 comes into play. With the Big 12 becoming football version of the Blue Angels air show finding linebackers that can stop the run and cover the pass is invaluable. In his short time on campus Robinson has shown the ability to play the pass and that’ what puts him at the top of the depth chart at strong side linebacker. Texas will play with five defensive backs a lot this season, and that means only two linebackers on the field. Norton, who is a prototypical middle linebacker in the 4-3, has struggled in the nickel formation so if Robinson plays well enough he may be alongside Muckelroy when teams are spread out. 5. Is the work ethic there? For the first time in a long time Texas overachieved last season. It had more to do with expectations, but the Longhorns had a workman like feel that wasn’t the norm in the last decade. Will Muschamp has gotten a lot of credit for the attitude change, but more credit needs to go to the players and especially the leaders on the team. More than talent, UT lost some big time leaders in Quan Cosby, Roy Miller, and Brian Orakpo. Those guys kept the young guys in check in practice, off the field, and in the locker room. 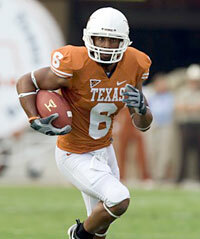 Texas still has established leaders in Colt McCoy and Sergio Kindle and new leaders are stepping up like Earl Thomas. But until the team faces some adversity no one will know if the team has the backbone they showed in games against Oklahoma and Ohio State last year. The 2005 team established that ethic in the summer with many players pointing out that they had worked too hard in June and July to let anyone beat them. If this year’s team comes out of the summer with the same feeling another special year could be on the horizon. Follow along below with our live thoughts and analysis during today’s second day of the NFL Draft that will take place starting at 9:00am on ESPN and the NFL Network. You can catch our live thoughts by tuning into this page and you can also participate in the conversation. Strengths: With his Superglue fingers and disciplined routes, the Quan probably was the Horns’ second most valuable offensive player. Adjusts well when his quarterback in on the move, catches the ball in traffic and is a very enthusiastic downfield blocker. Quick enough to get initial separation and makes both the routine and the acrobatic catches, rarely suffering a concentration lapse. Very mature player who leads by example. Strong enough to consistently beat jams, and can go up and get the ball over taller corners. All things considered, he was one of the most clutch players in the [tag]Mack Brown[/tag] era. Weaknesses: Small, only 5-9 and seems to have short arms. Quicker than he is fast, he couldn’t consistently get deep in college. Played in the spread, so he saw lots of single coverage. Just okay after the catch, if a DB wraps up he can’t power through. May be vulnerable to press coverage at the next level. Age (2926) is a concern to some. Overall: Due to the long careers many receivers have, age should not be a determining factor. Probably will be a #3 receiver early in his career, but with his discipline and effort he should be able to beat nickel backs and find soft spots in zone. Teams that employ the 3 WR sets would be well served to give him a look. Same size and speed of Wes Welker… just saying. I think I could watch Quan Cosby’s game winning touchdown over and over again, and now I can. The Fiesta Bowl isn’t the only game up on Hulu, you can also watch stuff like the US Army All-American game and the other BCS games as well. Texas came up big in the [tag]Fiesta Bowl[/tag] to finish the season 12-1 and move to 3-0 in BCS bowl games. A good mixture of older guys and younger guys stepped up to give this Longhorn team a win that was fitting for this team and season. Nothing came easy for Texas against [tag]Ohio State[/tag], but the leadership of this team ended up being too much for the Buckeyes. [tag]Quan Cosby[/tag] – I know Colt McCoy won the Offensive MVP award and it easy to give the top spot to the quarterback with the big numbers, but when Texas needed plays on third down and at the end of the game it was Cosby who stepped up and won the game. Cosby played inside more than normal to avoid Thorpe award winner Malcolm Jenkins and it paid off. Cosby had a career night in his last game as a Longhorn finishing with a career best 14 catches for 171 yards and two touchdowns. [tag]Roy Miller[/tag] – The Defensive MVP came up huge in the second half of his last game at Texas. The Longhorn defense struggled to slow down the Ohio State run game and Beanie Wells in the first half but did a much better job in the last 30 minutes. Miller was dominant, he demanded double teams and plugged the inside holes allowing the Longhorn linebackers to run free. The big senior finished with three tackles, a sack, and a devastating block on fourth and short on a drive in the third quarter. [tag]Colt McCoy[/tag] – What can be said about Colt that hasn’t already been said? He should have won the Heisman, he should be playing for the National Championship, he has all the Texas passing records, he’s as clutch as you get, and he has a smoking hot girlfriend. Am I missing anything? In a game that appeared to be an inconsistent one for McCoy he still finished with a career best 414 yards on 41 of 58 including a pair of touchdowns. Ohio State bottled him up in the run game minus one 14 yard touchdown score. [tag]Brian Orakpo[/tag] – The best defensive player in college football was the focus of the Ohio State blocking scheme. The Buckeyes were able to keep him out of the stat book for the most part, but they weren’t able to keep him from making an impact on the game. All night Ohio State kept a tight end and sometimes even a running back in to help block Orakpo. When they didn’t he got pressure on the outside on both Buckeye quarterbacks, obliterating Todd Boeckman late in the game. It took until the second to last play for ‘Rak’ to get his sack, but the play iced the game. [tag]Earl Thomas[/tag] – Thomas has quietly become one of the better players on the Texas defense. The red-shirt freshman has been the most consistent player in the secondary this year for Will Muschamp’s group. Thomas flies around the field and appears to be around the ball at all times. He also brings an attitude and swagger to a young secondary that needs it. 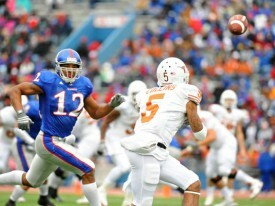 Thomas led the team with nine tackles and two pass breakups. [tag]Chris Ogbonnaya[/tag] – The Texas run game was nonexistent for most of the game, and it seemed to be more about play calling than anything else. On the first play for the Texas offense Ogbonnaya got the edge and picked up eight yards before fumbling out of bounds. For the rest of the half Texas abandoned the run. In the second half the senior running back was able to make an impact on the ground, and maybe even more so through the air. McCoy was able to check down to Ogbonnaya on many occasions to set up manageable downs and distance and to pick up first downs. He also caught the longest pass of the game, a 37 yarder. Chris ‘O’ has been the most consistent back all year for Texas and his leadership has been immeasurable. [tag]Roddrick Muckelroy[/tag] – I’m not for celebrating an injury, but the hit that Muckelroy delivered on Beanie Wells ended the game for one of the best backs in the nation. Wells had run for over 100 yards on only 16 carries when the two met in the hole early in the fourth quarter. Muckelroy has led the team in tackles all year and continued to be all over the field Monday night. The junior finished with six tackles on the night. [tag]Jordan Shipley[/tag] – The attention has gone to Cosby because of his performance, but Jordan Shipley played a great game as well. It was clear that Ohio State spent a lot of time attempting to take away Shipley’s plays over the middle of the field. Colt’s roommate, lifelong friend, and hunting buddy (in case you hadn’t heard) finished with 10 catches for 76 yards. 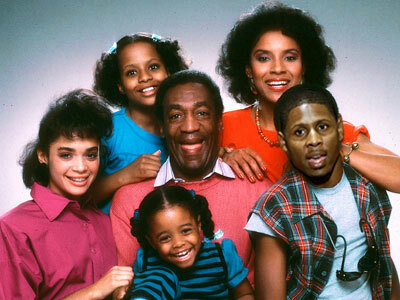 It appeared that Cosby’s first touchdown reception was actually on a pass attended for Shipley. The NCAA granting the medical red-shirt for Shipley next year is huge for this offense. [tag]Henry Melton[/tag] – It is amazing how far Melton has come. The Fiesta Bowl was a great showcase of Melton’s talent. The former running back is not as good of a pass rusher as Orakpo and Sergio Kindle, but he may be as good as an overall defensive end than both of those. Melton has a future in the NFL and he proved it Monday night against the Buckeyes. Melton was the best end at the point of attack all night, and took a lot of snaps away from Kindle. The senior finished with three tackles including a team leading two for a loss. [tag]Chykie Brown[/tag] – Chykie has become Texas’ lockdown corner. Ohio State tried to go to his side early but quickly abandoned that strategy. Brown has come a long way from the times when coaches worried about his practice habits and focus. Coming into the season some were wondering if the sophomore would ever live up to his athletic ability, now heading into the offseason the program will look for Brown to be a shutdown corner like Ohio State’s Malcolm Williams. The Ohio State passing attack struggled all night, and a lot of it had to do with Brown occupying the entire right side of the field. [tag]James Kirkendoll[/tag] – Brandon Collins had more receptions and yards, but it was Kirkendoll that came up with the fourth down grab that kept the Longhorns alive. On the play Kirkendoll came in motion to the inside before running an arrow to the sideline. Texas caught the Buckeyes in man coverage and took advantage of the matchup. It says a lot about McCoy and the coaching staff that they trusted one of the younger receivers on such a crucial play. The sophomore from Round Rock just got the first down and a few plays later Texas was celebrating the winning score. The one thing I don’t get is how they take that game and make it a case that the [tag]Big 12[/tag] isn’t physical. Beanie Wells ran all over the Horns in the first half due to out of position linebackers and poor tackling by the secondary, not due to getting beat in the trenches. On the other side of the ball the offensive line didn’t play any worse than they had during conference play this season, it’s nothing new for Colt to be under constant pressure. It would be a thing of beauty to see what he could do in 2009 with better running game and blocking, hopefully we get to find out.